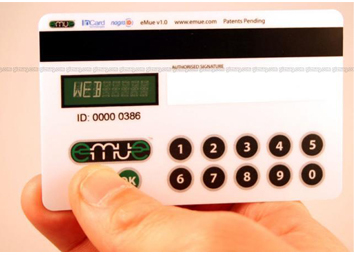 The Credit Card Embedded Authentication Device has a twelve-button keyboard, a microprocessor and a built-in alphanumeric display. Now we've got security in the palms of our hands. For example, if you had this card, you could enter your PIN into your own card's interface - rather than into somebody else's device. Remember those clever hacks that put a card reader in front of the bank's card reader on ATM machines? The Credit Card Embedded Authentication Device would accept your PIN and then request a one-time-only passcode for the current transaction. Bank fraud costs financial institutions an estimated four billion dollars annually - and you'd better believe they would rather be spending that money putting a bank on every corner.